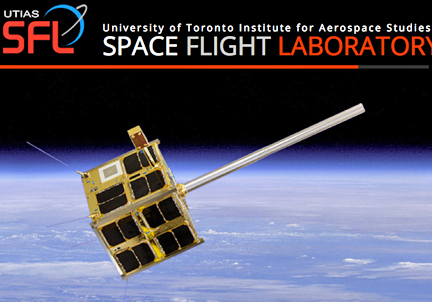 After collecting more than 4.3 million Automatic Dependent Surveillance – Broadcast (ADS-B) messages from aircraft since it launched in September 2016, the 3.5 kilogram 10x10x34cm CanX-7 nanosatellite deployed its four drag sails earlier this month — CanX-7 was built by Space Flight Laboratory (SFL) at the University of Toronto Institute for Aerospace Studies (UTIAS). Each drag sail has an area of approximately one square meter. The sails are intended to decrease the ballistic coefficient of the satellite and use atmospheric drag to accelerate orbital decay. The drag sail technology is important for nano- and microsatellites whose low Earth orbital presence would exceed the Inter-Agency Space Debris Coordination Committee (IADC) guidelines that limit such presence to 25 years after end of mission. Photos: (l) CanX-7 in SFL Clean Room — (r) CanX-7 with drag sails deployed. CanX-7 completed a seven-month campaign to collect ADS-B messages from aircraft to demonstrate Canada’s first ADS-B data collection from space. With that phase of the mission successfully completed, the drag sails were deployed to begin the second phase of the mission. The sequential phases were intended to emulate an operational mission followed by de-orbiting. A key component in the drag sail technology demonstration was long-term stowage of the drag sail modules in space without interrupting or affecting the operational mission. During this final phase of the CanX-7 mission, the de-orbiting process will be closely monitored via the SFL ground station in Toronto. Orbital decay rate will be determined and compared against pre-launch simulation results.